My city run last Friday was a great lead-in for a satisfying weekend of running. It's rare that I string three days of excellent running in a row like that so I appreciated it all the more. All that running has made me think about my summer racing schedule and the races and distances that I should target. We're more than halfway through April and I've still not decided how, or even if, I'll compete in May. 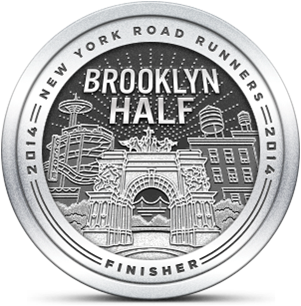 I've considered the RXR LI Marathon's 10K, stepping up from the 5K that I ran last year. The 5K course was flat but uninspiring, more like running in an industrial park than on a race course. Except for that, there aren't many local races to choose from in distances greater than 5K. I love running 5K's but I'd like a little more variety and distance right now. June has the opposite challenge. There are two races I'd like to do - the New Hyde Park 8K and the XTERRA trail series second Stillwell race. As I reported back in March, the first Stillwell XTERRA was pared down to about 3.5 miles due to icy conditions on the trails. Even at that length it was a great struggle to manage that course. The June race won't have the ice factor so the run will be an 8K over difficult terrain. Even with my daily running, hill training, cross training and passion for the trails I'm concerned that I could run competitively that day. I would train even harder than I did for the first one and I think I'm in better shape than I was in early March when I was still dealing with residual issues from pneumonia. The New Hyde Park 8K is a less interesting course than Stillwell but I've felt like I had a score to settle because the original race result posted me at 9:00 per mile and I really wanted to break 9 minutes. I checked the results again and they now have me listed under 9:00 so that argument is moot. I'm going to take a look at the RXR 10K course map to see if that route is more interesting than the 5K. I still have a little time to decide on June's challenge. I understand the whole finding races issue. 5K's are out of the box full flying, but it is hard to find anything above that, unless you want to travel. Looks like you have some choices to make. Whichever the case, I am sure that you will do fine. Best wishes on your training. I'm thinking that the 10K may be my best choice for May. The course wraps around a park so it's much nicer scenery than the 5K course. Why not, right? Go for the 10k! Best wishes in your training man.